With increasing commissions on OTAs it has never been more important to get as many direct bookings through your hostel website. Your hostel website is likely the best tool to get most of your direct bookings. Hostels need to create a clean and attractive website to convert possible guests into bookings. Here I focus on 5 key areas which all hostels should look at to help improve a hostel’s direct bookings. Why does speed matter? The data shows that every extra second your site takes to load you are losing customers. For more data on this check out this blog on loading time from kissmetrics. The first thing you need to find out is how fast your website is and from there how to make it faster. Run a test with gtmetrix for an overview of your website speed. Often you might not even need to change your design of your website but tweak certain parts of it. Get rid of that constant playing video, that music in the background, and the animations filling up the screen. These might all seem great but they may both annoy the guest and lose them if they take a few seconds to load. Also make sure to check that all the images are optimized. Too many times there are large images a few MB in size loading on a website when they are not needed. Reducing the loading time will lead to more direct bookings as the potential guests are not exiting your website while trying to book. Content is key to converting your customer. You are mainly getting two types of customers to your website. The customer who has already researched your hostel, maybe on an OTA, but is looking to book direct. For them you want to make the booking experience as easy and user friendly as possible. The second customer is the one looking for further information. For them you want to give enough content to convert their visit to a booking. You want content relevant to your market audience. What you don’t want is to overload the visitor with too much information. Make sure to show bright and colourful photos that best showcase your hostel. Are their specific issues with finding your hostel that causes challenges to guests? Explain this clearly on the directions page. An FAQ section is a must. It also prevents repetitive questions from being e-mailed to you before a booking. If your area is not a popular tourist destination then give plenty information on what to see and do and you might just turn a 1-night booking into a 3-day booking. Unless you want to lose a share of your customers to the OTAs or another hostel make sure you have a booking engine on your website. A web form is not a booking engine. You will lose a lot of customers by just having a web form. Hostel guests are not as patient as they were a few years ago and want immediate confirmation of their reservation. People want to know if their bed is confirmed now, not in 24 hours when you reply. Even if you want to use an OTA booking engine on your website, do this, but at least have one so people can book. Some people might take the time to phone, e-mail, or fill out a form but you will lose much more if the only way people can find you is on an OTA. Once they are on the OTA they might book your competitor. 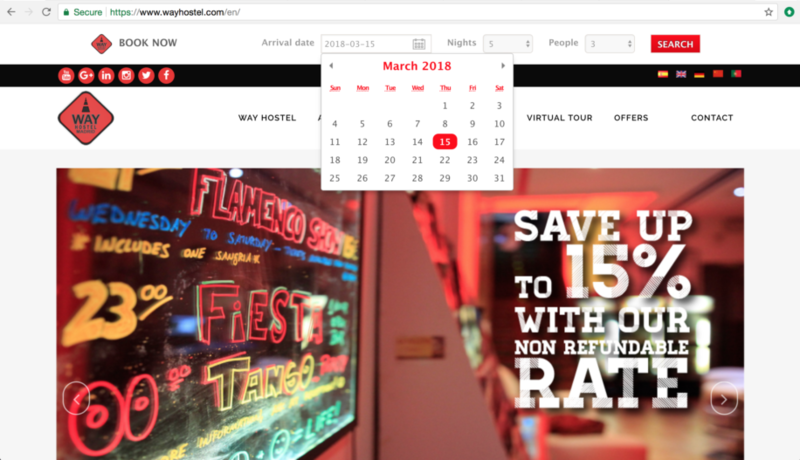 Many small hostels see a booking engine as expensive and an unnecessary cost, but with some booking engines costing as low as one bed night in a dorm for a monthly subscription it is well worth it. Goodmorning hostel’s booking engine show’s real time availability and prices and provides visitors with an immediate confirmed reservation. So do you know who is visiting your website? Are you converting these visitors into bookings? This is a missed opportunity if you aren’t. 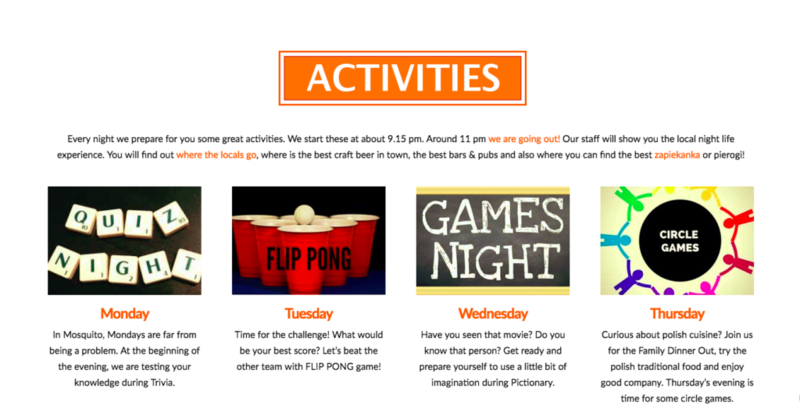 Just a few minutes spent each month looking at your google analytics can really help your hostel. The main things you should look at are the number of visitors each month. This should go up and down depending on your low and high seasons. Also, keep an eye on where people are coming from. Are they coming from Social Media, Review Websites, Organic Search or Direct? What parts of the website are they visiting? Are they going directly to your contact us page? Are they looking at your location page? All these will help you better understand your customer and convert them into direct bookings. There is some further information on the link below to better understand the basics of Google Analytics. a) What languages do your current guests speak? You can find this information out easily. Converting the website to their language will make things easier for them and reduce the number of them going to an OTA for information in their own language. b) What languages do your website customers speak? Looking at your google analytics you can get the information of where people visiting your website are from. You might see that you are getting 10% Chinese visitors but not 10% bookings from Chinese on your website. If you are getting 10% of bookings on your OTA from Chinese then you can deduce that Chinese customers come to your website and have difficulty booking as it is not in Chinese. They then go to the OTA with the Chinese language translation. c) Look at your competitor’s customers. Maybe your competitor is getting a lot of French guests and you are not sure why this is so. Maybe their website is translated into French and they make it easier for French guests to book directly this way. So what parts of your website are you going to improve? Are you looking at increasing direct bookings through your website? John Moriarty has grown up in the tourism business. He owned and ran Dunloe View Hostel for 5 years before creating Moriarty Web Design. Moriarty Web Design is to help hostels and businesses improve their web presence. He is continually combining his tech, tourism and customer service knowledge to improve his own and other businesses.